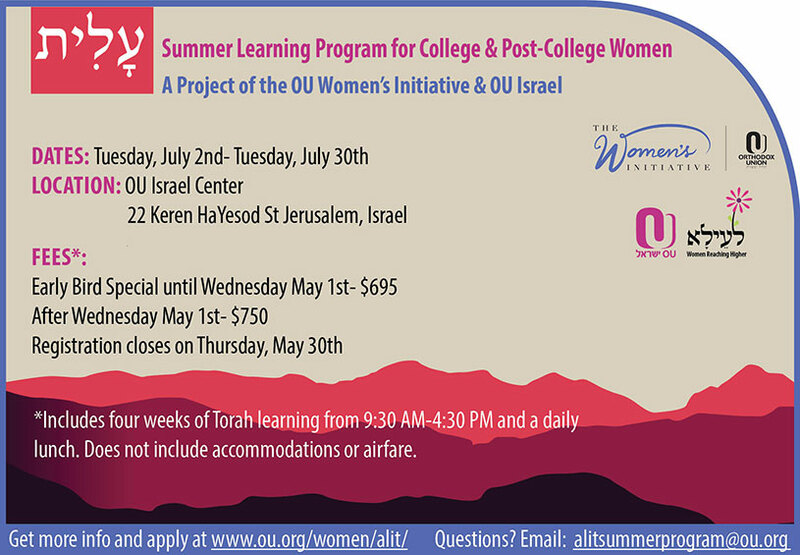 Do you want to spend your summer in an immersive Torah learning program for women in Yerushalayim? Join us on ALIT: A four week Torah learning program in the heart of Yerushalayim at the OU Israel Center. Delve into Tanach, Halacha and Hashkafa with incredible seminary teachers and OU Israel educators. Spend a month focused on your growth in ruchnius along with other college and post-college women. Take part in weekly tiyulim, optional night programming and Shabbatonim. Registration closes on Thursday May 30th. *Both rates include 5 days of learning each week from 9:30-4:35, weekly tiyul, daily lunch and optional Shabbatonim. Flights and accommodations are not included. Orthodox Union © 2019 All Rights Reserved.